Enova Hosts Black Girls Code Meet and Greet Kickoff Celebration - Enova International, Inc.
Black Girls Code is a non-profit organization whose mission is to expose girls of color to coding, along with bridging the gender gap. 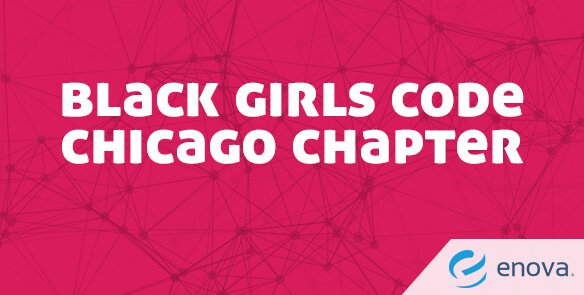 Black Girls Code is opening a chapter in Chicago. Hooray! Enova recently hosted our Meet and Greet Kickoff Celebration. Attendees included parents and teachers, along with visitors genuinely interested in Black Girls Code. The event kicked off with a special message from the Regional Program Director, Raven Ali. The message underscored the purpose and ultimate goal for the organization. Soon after, there was more information dispensed about BGC, including the amazing classes and opportunities planned for Chicago. The adults and the children were actively engaged in learning about the organization — there was a plethora of questions from both. The event also included a presentation from Ann Yeung, Senior Director of Software Engineering at Capital One. She imparted a few tokens of wisdom and advice to the attendees. It wouldn’t be difficult for the girls to make a connection that they too can achieve success as a leader and/or software engineer. The cherry on top of this amazing event was an interactive robot demo. The children had an opportunity to control the robot’s movement and sound using drag-and-drop coding. It was my first time learning about this coding technique. Its core purpose is to teach introductory coding to children to keep them engaged, while learning key concepts of coding and having fun. The evening was punctuated with the girls treated to an endless supply of ice cream and their choice of the remaining pink and black balloons on display. Needless to say, the girls left with a fun-filled, positive, educational experience that will surely have a lasting impact on them.